When my children were small we took them to an educational facility in Redondo, and as a treat afterward we would take them to their favorite cafe. My son was about eight years old but had the appetite of a teenager, and he was ordering full meals at Eat At Joe’s and polishing off everything on the plate. He is more than three times that age now but still likes the place, and on a recent afternoon the family went back for a nostalgic visit. 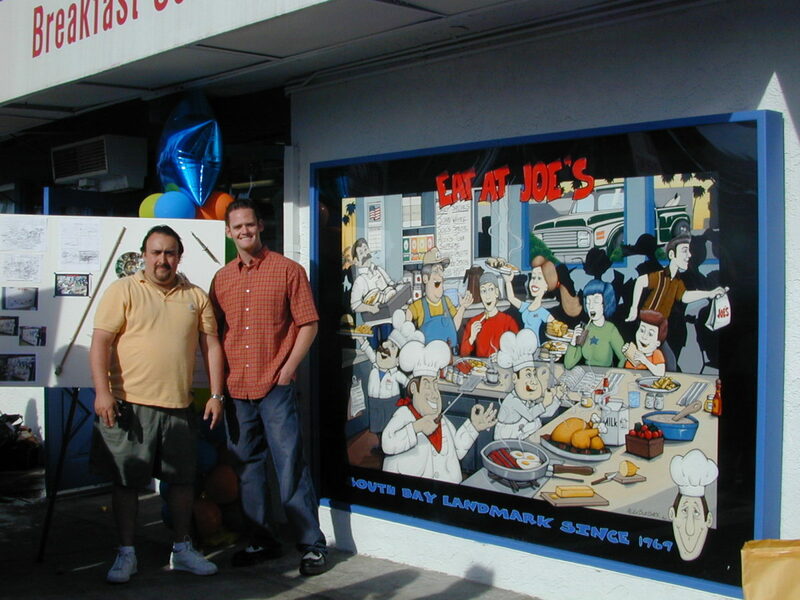 No doubt, many of the people around us had the same long history with the place, because Eat At Joe’s has been serving since opening in 1969. 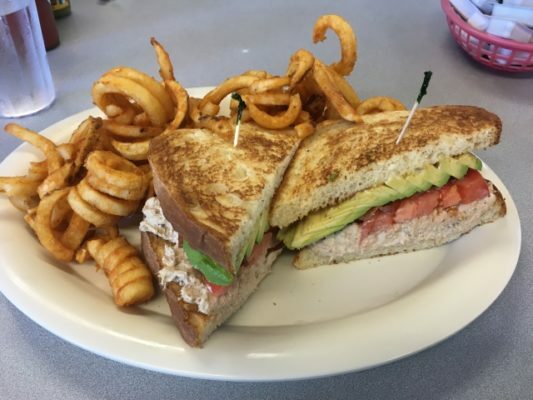 While they have made a few concessions to modernity, such as some items labeled on the menu as “healthier” (based on the Blue Zone program, administered by the Beach Cities Health District) the basic formula hasn’t changed: classic American diner fare, and a lot of it. We stopped in on a Saturday and were seated immediately at one of the long shared tables. We had timed things just right, because a few minutes later there was a crowd outside. This is the usual state of affairs on weekends, but since the room is big and the service is fast even a daunting line tends to move quickly. Most of the people who are waiting more or less patiently know what they want when they walk through the door, but as we’re only occasional visitors we had to actually look at both the menu and the specials board. One item on the board will puzzle newcomers: the “Mad Dog” special. A highway patrolman with that nickname was in the habit of ordering a cheese omelette with whatever was left over from the previous day’s special, and on the day we were there it was beef stroganoff. I presume that Eat At Joe’s never ran a fruit salad as a special just to mess with Officer Mad Dog. I considered ordering this but a stroganoff-covered omelette sounded like a lot of food, especially by the generous standards of Eat At Joe’s, so I had a Tony Capozzola omelette instead (named after the local, criminal defense attorney). That’s Italian sausage, mozzarella, bell pepper, and onion smothered with meat sauce, which isn’t exactly the dieter’s special either. The three-egg omelette was served with good. crisp home fries, though during the week hashed browns are also available. I don’t know why you’d prefer them, because Joe’s home fries are just fine. Breakfast also comes with your choice of toast, tortillas, or a somewhat dense biscuit that is probably a great base for a plate of biscuits and gravy. My wife selected a plate of fried chicken breast and eggs, our son a Hawaiian loco moco, and his girlfriend chose French toast with bacon and eggs. There’s nothing much to say about French toast with bacon and eggs except that they did it right and there was plenty of it. I know, because I tried to think of something other than that sentence to describe it and there isn’t one. There’s plenty to say if someone messes it up, but pros who have been in the business for over 50 years know better than to do that. The fried chicken and eggs was a bit more noteworthy because the chicken was a pounded and flattened whole breast, a not-very-moist cut that is easy to overfry and turn into jerky. They didn’t do that, and as a bonus there was some mild seasoning in crisp breading that made it even more enjoyable. My son’s loco moco was a lot of food even when compared to the rest of our meals, but that’s about what you’d expect from an item created for Hawaiian teenage wrestlers who wanted to load up on carbs. At its simplest this is white rice topped with a large hamburger patty, brown gravy, and a fried egg, but Hawaiians have developed all manner of variations on that formula. Those with an artistic bent put the egg on top of the gravy and sprinkle some chopped scallions to make it look pretty, but here the gravy is poured on top. I like Eat At Joe’s loco moco more than most because the gravy isn’t sweet the way it is at some Hawaiian places. But it’s not a dish I’m likely to ever order because I’d be hard pressed to eat half of it. My son did impressive damage to it before giving up and getting a to-go box for the rest. To drink here you have a choice of soft drinks, juices and teas, milkshakes, or coffee, and we’re not talking fancy lattes because this is a diner. This is one of the last breakfast places in town to have no baristas on staff, and that’s okay. I like fancy coffee, but if that’s what you want you can go across the street and get it from The Boy and the Bear. Eat at Joe’s has pots of commercial grade coffee on the table, and if you keep pouring until it’s gone they’ll refill them. It is black and will keep you awake, and sugar or little plastic containers of half and half are available if you need them. We were groaning slightly as we went to the car, and I joked that after only a day or two I might be hungry again. It actually took me two days to return because I found myself in the neighborhood around lunchtime. I like chili size (an open face burger covered in chili) and they have it on the menu, but in a moment of caution I asked for a taster of the chili first. I’m glad I did, because it was a very bland mix of ground beef and beans. My server suggested that if I wanted it spicier I could add hot sauce, and they do offer a wide variety, but that’s not the same thing. I decided to get an “Alex’s tuna supreme” sandwich instead, and that hit the spot. It’s tuna salad with bacon, avocado, and tomato on toasted sourdough, and it’s really a good combination. I got it with the seasoned curly fries, the mere existence of which keeps this out of the “healthier” category, but I didn’t eat all of them so could feel at least slightly virtuous. It’s just about impossible to spend fifteen bucks for a meal and drink at Eat At Joe’s, but that’s only part of the reason they’re so popular. If you need to be reminded of the virtues of solidly traditional homemade diner food, this is one of the rare places that makes it day in and day out. Abandon trends, all ye who enter here, and enjoy the flavors that you liked as a kid. They’re still here and still worth the wait in line.